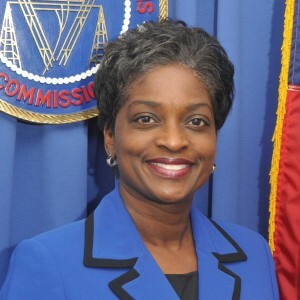 Mignon Clyburn began her service at the FCC in August, 2009, after spending 11 years as a member of the sixth district on the Public Service Commission (PSC) of South Carolina. Mignon L. Clyburn served as Acting Chairwoman of the Federal Communications Commission, following her appointment by President Barack Obama on May 20, 2013. As Commissioner, she isserving a second term as a Democrat on the Commission, for which she was sworn in on February 19, 2013 following her re-nomination by the President and confirmation by the United States Senate. Clyburn began her service at the FCC in August, 2009, after spending 11 years as a member of the sixth district on the Public Service Commission (PSC) of South Carolina. She served as its chair from July 2002 through June 2004. Prior to her service on the PSC, Clyburn was the publisher and general manager of The Coastal Times, a Charleston-based weekly newspaper that focused primarily on issues affecting the African American community. She co-owned and operated the family-founded newspaper for 14 years. Clyburn is a graduate of the University of South Carolina, and holds a Bachelor of Science degree in Banking, Finance and Economics.